I didn't know Tulane was D-3...I should've transferred there. I might actually have a shot at making a D-3 club. Speaking of North Dakota, I miss the old Sioux logo, not the more realistic depiction. Are you referring to the old geometric rendering brought on as a way to pacify the anti-nickname contingent fighting the school's use of the Blackhawks logo? 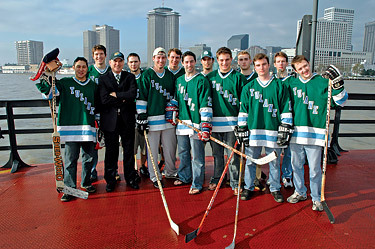 Now, those old Fighting Sioux blackhawks jerseys were classics. For my money, any Fighting Sioux jersey is top class. But I'm an alum. I'm supposed to say that. 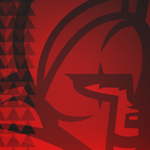 Yeah, I kinda liked the geometric rendition. As an alum, I'm completely ashamed of those OSU alternates. Nike did fine with the football and basketball (both Nike and LBJ) sets but fouled hockey up pretty bad. A wordmark out of MS Word and barbershop poles? C'mon. Couple of shots of my team's jerseys...Go Lions Go! There isn't a D-II in NCAAS Hockey anymore. A lot of these a club level. Hmmm... Most of those southern clubs are D-III in that ACHA. I know Iowa State is D-1 and Iowa is D-2. I would think after the success of Alabama-Huntsville this year in the NCAA Tourny, you'd think some schools would take the chance to have varsity teams. You have to have a rink. I would bet that most of these club teams play at local ice rinks that are primarily used as practice facilities and for youth hockey and doesn't have the seating. It would be rather expensive for the schools to build a ice rink that would be capable of spectator viewing. 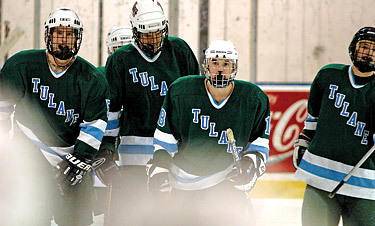 Wow, I did not know Tulane had Hockey. I'm pretty sure they are D3 for hockey only. Bow before my superior smartitude! 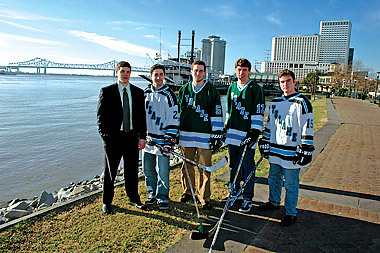 Oh man, I want one of those Tulane Jerseys. For a Third, I demand a skating Riptide. Nothing else will do. Yeah, but it's not even NCAA so that doesn';t matter. They're ACHA D-III. I had a chance to see them play FSU in Pensacola after an Ice Pilots game, but that was when I was 14, couldn't drive, and Dad had church the next day, so being that it was already 10 and we had an hour drive ahead of us, we elected not to stay. 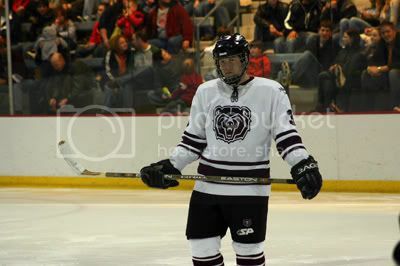 Missouri State (ACHA-II) home uni's. I'm partial, but I love 'em. I believe the roadies are maroon with the "Missouri State" logo on the front. I'll admit that I'm just a little biased, but I agree completely. I know for a fact Kennesaw plays at a ice skating place, i also knows one of my friends team plays there. but, KSU is allowed to kick other teams and groups of the ice. Those Colorado Buffaloes jerseys are shaaarp. Where's the love for Canadian college hockey? Let's change this shall we! You tell us! Where are the people watching the game? The only thing I see in the stands is a row of Canadian Tire logos. Thanks for the pic EZ. I believe that's MO State's JV team, aka Missouri State White (they were at KU Sept. 15-16, the varsity didn't play KU this season). Their home jersey is the exact opposite - plain white sweater with the bear head. MO State was going to have a D-III and a D-II team, but instead went with two D-II teams - a JV and varsity - so they could transfer players between the two rosters without affecting eligibility. 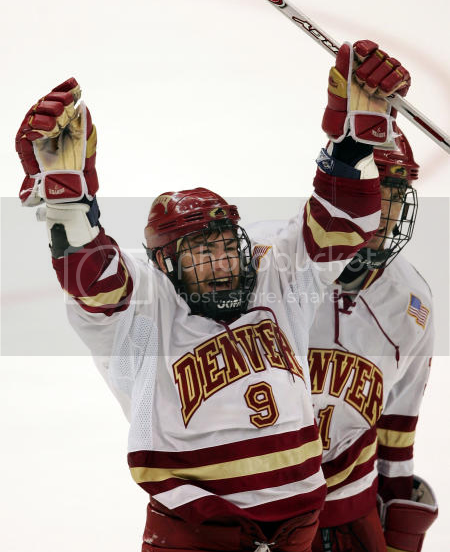 I have to say I like the Denver Sweaters, I like the number under the name, thats a nice look with a great color scheme. 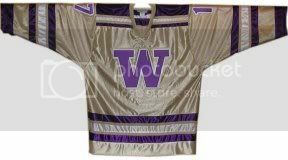 As for DII club, these are our jerseys here at the University of Washington. They aren't bad (I had a hand in "designing" them (aka using paint and Roger's templates) but I'm still on the fence about the material. I think I'm a fan of air-knit more.